Dragon2000 have announced the latest version of their APPraise app has been released, adding new features, improvements and a brand new look to the screens which makes it even easier to use. Available to all DragonDMS dealer management system users as part of their subscription, car dealers and garages can create vehicle appraisals, perform vehicle health checks and advertise your stock – all from your mobile phone or tablet. As the APPraise app is seamlessly integrated with the DragonDMS these records can then be accessed and progressed within the dealer management system. The latest update allows dealers to add and advertise stock from their mobile or tablet on the move, and also gives you the ability to have your appraisals digitally signed to avoid disputes about condition. The app is available for both Apple and Android devices, on both the Apple Store and Google Play. Advertising your vehicles has never been easier or faster – add and manage stock, take or attach images, specifications and advertising information such as pricing and advert text. Then just simply select where you want to advertise your vehicle, including your own website and a number of online advertisers. Garages and workshops can create easy Vehicle Health Checks (VHC) with videos and images. Your Technicians can undertake custom made VHCs checklists, including taking images of any defects found, and have the ability to send the customer a video explaining the issues they have found – a guaranteed way to increase and up-sell service work. Car dealers and garages can create and view existing vehicle appraisals record the condition of part exchanges, stock vehicles, vehicles in for service work and courtesy cars with images and videos. 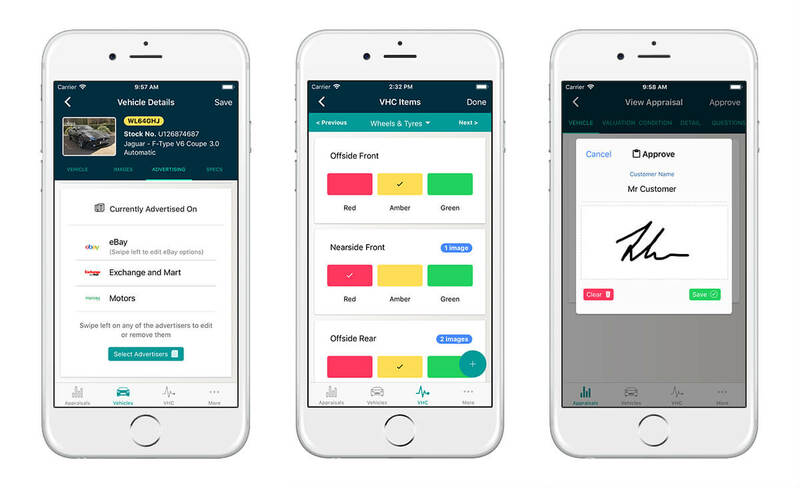 You can even ask the customer to digitally sign the appraisal on your device, agreeing to the condition you have noted, which can also be viewed within the DragonDMS. Record and send walk-round videos of vehicles in stock to prospective customers. Simply point, shoot and send – it’s that easy to shoot a video of a vehicle you have in stock and send it to a prospective customer. You will be notified as soon as they watch the video – this is a great way to engage customers and has helped hundreds of car dealers to secure the final sale. – View and send existing sales videos from the app. You can also see how many people have watched the video and who it has been sent to.